Read real Easirent Car Hire customer reviews from today, yesterday and all this month. At Easirent we take every measure to ensure our customers get the best possible service. It’s important to our reputation as a smaller company competing in an ever-changing market. Easirent constantly asks our growing customer base for feedback on matters such as the quality of your hire vehicle, how effective our call handlers were and if you thought our drivers were polite. Car Hire, like every other travel related service, is prone to negative reviews. Long flights, limited time, airport queues, traffic, car breakdowns, unfamiliar vehicles, etc. All these factors influence customers’ patience and the service delivered to them. Because we are based out of the airport, we avoid the heavy airport fees which allows us to provide luxury, brand new cars to our customers. We offer a free collection or shuttle service so customers instantly feel looked after plus we operate a prepaid fuel policy to save you trying to find the nearest petrol station. To avoid bad reviews, we like to encourage all our customers to READ OUR RENTAL TERMS thoroughly before booking. Easirent is a fast growing British owned Car Hire company and we value customer feedback to help us improve our services. Our Social Media Team reply to reviews daily, and you should never feel that your opinions are invalid as every review counts toward our monthly scoring system of the branches. We use this scoring system to investigate the issues at the branches performing poorly and to reward those who are scoring highly. We have a dedicated Customer Service Team in place at our Head Office ready to solve any problems that might occur during or after your hire. Our Customer Service Policy states that we will respond via email within 14 working days. Whether you have a damage dispute, refund request, or complaint, we try to make your aftercare experience as hassle free as possible. You can also use this channel to request invoices, photographs or reimbursement. 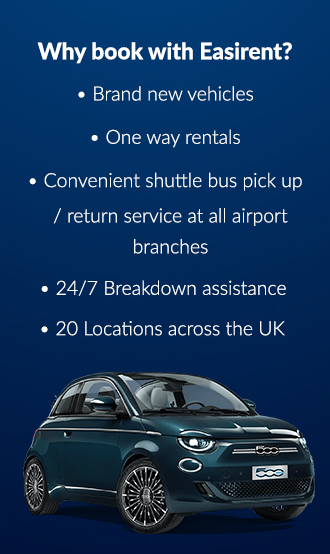 Please contact our team on 0203 657 6045 in case you have any problems during or after your car rental. For a full list of Customer Service FAQs please click here. To open or follow the progress of a case, please visit the ‘Customer Services’ section in Manage My Booking. Operating in 27 locations throughout the UK & Ireland we also heavily rely on our representatives to deliver the service our customers are expecting from us. This is why we encourage reviews that outline our best staff members and feed them back to our branch managers. However, we warn against personally naming a staff member for negative reasons and usually report and remove these due to protection rights against our employees. Our employees hold the right to have their name removed from any review, good or bad at any time for privacy. We’re currently rated 6.7/10 on Trustpilot putting us as one of the most highly rated Car Hire provider in the UK. You can see below how our customers rated us on various trusted review sites. Q: Why haven’t I had a response yet? A: Customer Services is open MON-FRI 8:00 AM – 6:00 PM GMT. We work as quickly as possible to get to each request, however, please allow 14 working days for a response, especially in cases that may require external bodies involvement. Q: I’ve sent multiple emails but had no response? A: Once a case has been resolved, or a final decision has been made, no more emails will be sent from Customer Services and the case will be closed. You can contact us on social media if you are unsure and we will confirm if you have had your final email sent or not. Q: I’ve been charged for something after my hire has ended? A: Charges made after a hire has been finished are usually Penalty Charge Notices or damage costs. In any case, you will always be sent a copy of the damage report/speeding ticket/congestion charge to the email address you provided at the start of your hire. If you need to request a copy of these, you can email in with your Rental Agreement number and we will get those sent out to you. Q: Still waiting on a refund or deposit to be released? A: Although we release your deposit within 72 hours of your end of hire date, it can take up to 10 working days for it to appear in your account. Refunds, once processed will take 72 hours (3 business days) to reach your account, depending on your bank. We advise you keep checking and only get in touch with us after the allotted time has passed. If you need to check on the status of your refund, our Social Media Team can help. Please be aware that if you booked through a third party (comparison site, travel agent, etc) then your money can only be released from that company. We do not hold the funds to refund you and contact must be made with your booking agent. ALL REFUNDS ARE PAID OUT IN THE ORDER THEY ARE AUTHORISED. PLEASE BEAR IN MIND IF THERE IS A BACKLOG OF REFUNDS YOUR REFUND WILL BE IN A QUEUE. Q: I wasn’t aware of this clause when I booked? A: If you are unsure of any of our policies please see the Terms and Conditions that you agree to when making your booking and signing your Rental Agreement. Q: I’ve been charged for fuel after my hire? A: Our fuel policy can be found here. If you choose Full-to-Full and return the car with a less-than-full tank, you will be charged 3GBP/LITRE in line with competitors. If you return the car full but are unable to provide a valid fuel receipt proving you have refilled within 5 miles from the branch, then the branch will take the car to be refilled and charge you our refill costs plus an admin fee of £9.50. For pre-purchase fuel (full-to-empty) you are charged pump prices for the location so it may appear cheaper elsewhere in the country when you re-fill (non-airport). Remember, it always works out cheaper and more convenient to purchase fuel at the start of the rental than pay for it at the end. Q: There was a fault with my vehicle during hire? A: You have a duty to report any fault to your branch immediately and if any damage is caused as a result of this fault, you may be liable for the cost. Your branch will instruct you what to do with the vehicle at the time, Customer Services can only help with the aftercare, based on the information provided. Q: I have a complaint about a specific member of staff? A: If you feel you have received a poor level of service from anyone at Easirent we encourage you to report it to social@easirent.com so we can bring this to the attention of the Regional Managers. Our staff are continually trained in providing a good level of Customer Service, Satisfaction, Politeness, Friendliness and Helpful Empathy guidance. If a member of our Staff is not following our guidelines then we need to know about it. Q: I’m unhappy with my response, what can I do now? A: If you wish to escalate a complaint, you can request for the Customer Service Manager to review your case. If they feel your case is exceptionally complex they may review the final decision. As Customer Services will explain to you, it is your prerogative to take further action if you feel it is required and we store all our email records as supporting evidence, should it be called upon. Q: I don’t have access to a computer? A: All final decisions need to be made via email so that there is a recorded copy but you can also call our Customer Services team on 0203 657 6045 and they will be able to best advise you on the process or status of your complaint. If you wish to send a complaint in writing you must ensure a return email address is included for the team to reach you on. We always recommend contacting us at Customer Services first before leaving a review of our company so that we have the chance to rectify any issues you might have had. You may be contacted by our team to amend your review once your case has been resolved. It is important to note that under no circumstances will our staff tolerate any verbal or physical abuse and if you use threatening language or actions in your correspondence then you will be automatically filtered out and your email address may be blocked from contacting us.